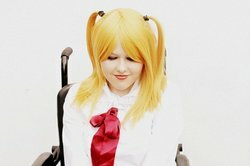 Misa on Wheels is a cosplayer based out of New England. She started cosplaying at conventions about six years ago and found her passion, as well as her most amazing experiences, through this wonderful community. She got her well-known nickname from a dear friend she met in Artist Alley at her first con: "Misa" being the female lead in the anime Death Note, who was her first and most beloved cosplay, and "on Wheels" being her primary method of travel. Misa was born with a form of Muscular Dystrophy, called Charcot-Marie Tooth disease, or CMT for short. The condition made the nerves in her lower arms and lower legs extremely weak causing her to start using a wheelchair at age 10. Misa can be found in a great many places on the web, but she calls www.facebook.com/MisaOnWheels home. She started the page a couple years back as a place to share photos, convention stories, and her thoughts on cosplay. It has since become the stage for her message, "Cosplay is for Everyone."